The Econocoin II electronic coin checker is ideal for quick weighing of loose or bagged coins. 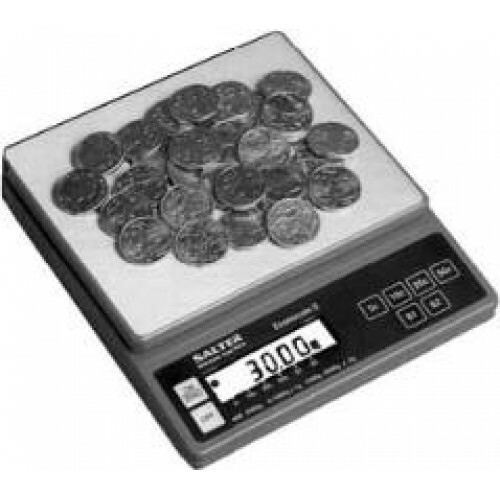 Features include sealed membrane push buttons for coin denomination selection, on/zero and off, a 132mm x 160mm stainless steel weighing platform. The easy to read 10.5mm high character LCD, displays either weight or coin value. The display also indicates the currently selected coin denomination. Use of the zero key allows elimination of any container weight.The Econocoin II is powered by a 9V battery (not supplied), or an optional 9V mains adaptor, and features an auto-off function.